"My place, tonight, 8:30. My mother's got bingo. Bring your gun." Amid the incessant and extremely annoying bickering of the lead characters in All Saints Day, I searched for some reason for its creation. I'm still looking. Filled with unoriginal toilet humor and dull, recycled jokes, this film succeeds in producing one of my most maddening viewing experiences of this year. Shot on an extremely low budget, the story follows five dimwitted amateurs who decide to rob verbally abusively shop owner Red (Ray Garvey). As expected, everything goes wrong from the start, and the characters continue to create annoyance through several different settings. It follows the tradition of the entertaining ride of Guy Ritchie's Lock, Stock, and Two Smoking Barrels and the whimsical comedy of Wes Anderson's Bottle Rocket. Both of these films featured heists gone bad and contained silly and likable characters. Unfortunately, this movie falls well short of this standard and drags considerably even through its brief running time. Beginning with the phrase "based on a true story . . . very loosely", the story presents the depressing daily life of Marco (Mickey Blatt) and his job at Red's fish market. After a former acquaintance asks him on a date, Marco is given a series of dehumanizing tasks from Red that scare her off completely. He makes minimum wage and has worked there for eight years. In fact, his wage is less than the current minimum wage, since Red never gave him a raise when it was moved up to $5.15 an hour. Marco's life is a constant series of humiliations, and he must do something to escape this monotony and gain revenge over his uncaring boss. The result is a simple scheme to sneak in and rob his safe (which contains drug money) that should work without any hitches. Of course, nothing goes as planned. To assist in his idea, Marco recruits best friend Louis (Tommy J. La Sorsa), the constantly nervous Hardware (James Patrick McArdle), ladies' man Matthew (Mark Love), and chicken-suit wearing Johnny (Christopher Lynn). This bumbling group of thieves spends the entire night squabbling and fighting among themselves, and the result is pure tedium. Co-writers La Sorsa and Lynn throw in plenty of gags, and nearly all of them fail completely. Even the relatively funny segments feel staged and lack the spontaneity necessary for great comedy. They're the type of scenes that made me think "that's funny," but they don't generate much laughter. Also, the stupid and crude humor doesn't work and helps to increase the inane nature of the story. Clever buddy films like Doug Liman's Swingers are filled with originality and characters that are worth following, but this one contains neither of these elements. This type of movie rises or falls with its cast, and unfortunately this group isn't up to the task. Blatt draws pity from his portrayal of the troubled Marco, but I never connected enough to really care too much about his success. McArdle creates possibly one of the most annoying characters in any film released in the past few years. His nerve-wracking chatter grows tiresome quickly and lacks the ingenuity necessary to make it acceptable. Ray Garvey does achieve the goal of making Red a vicious fiend, but his tirades would be more effective on a compelling lead character. Assuming this film is really based on a true story, I would be interested to know what parts come from real life. It's hardly possible the actual people could be as boring as these characters. 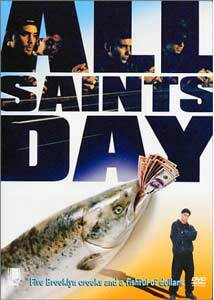 Image Transfer Review: All Saints Day contains a poor 1.66:1 widescreen transfer that offers an often fuzzy picture. The images lack focus and include a large amount of grain, especially early on in the film. While this bad quality does correspond with the low-budget nature of the movie, it hinders the action and makes it appear even less interesting. The colors lack brightness, and this transfer provides little to keep the senses entertained while the mind drifts into a forced slumber. Audio Transfer Review: The 5.1-channel transfer on this disc has plenty of force, but it fails to utilize the surrounds effectively. The dialogue is clear and understandable, and the music blares nicely through the front speakers. However, the overall sound field remains mostly in the front and the transfer lacks depth. The rear speakers contain mostly quiet background music and ambient sounds that add little to the story. However, this track does dwarf the tame Dolby Surround track, which is too quiet and probably shouldn't have been included on this disc. Extras Review: All Saints Day's only notable extra feature is a 16-minute interview with writer/director Tommy J. La Sorsa, who also starred in the film. He describes this extremely low-budget form of filmmaking, where he would petition high rollers for funds while working as a waiter. The original concept for the story was written on napkins with co-writer Christopher Lynn in a coffee shop. Early versions were shot on video in order to woo investors and get them excited about supporting the film. I'm sadly amazed that there were numerous drafts and re-writes of the script. Much of the material comes off quickly written without much attention to details. La Sorsa does provide a lot of background into the production, and he is very straightforward with the large amount of work necessary to bring it to the screen. This disc also contains the theatrical trailer, which comes in a poor widescreen transfer. The colors are extremely grainy and lack much detail or brightness. All Saints Day ranks as the worst comedies I've viewed this year, and this list contains some poor films. The last one near this level was Little Nicky, but even that story contained more laughs. I can excuse this movie slightly due to its low budget and the limited amount of time to create a cohesive story. However, this does not excuse the writing side of the production, which should draw the most criticism. During his interview, Tommy J. La Sorsa appears genuinely interested in filmmaking. Hopefully, he will improve over the problems of this film and direct more complex stories in the future.